Are you ready for the intensive, dynamic training you need to begin or advance your career in marketing or advertising communications? In BCIT’s Marketing Communications Diploma program, you'll be immersed in the fast-paced world of marketing, working in groups to develop online and offline marketing strategies that drive results, through in-class lectures and labs. You'll also gain real-world experience in your 10-week internship in an organization's internal marketing department. Because this program works so closely with industry professionals, you’ll have access to the most current information in a rapidly changing industry, as well as networking opportunities to help accelerate or begin your career. Many marketing professionals recommend this program as the best training and, in fact, about 75% of program graduates begin work in the field immediately after graduation. Learn more about how this program helps prepare you for your career in the Program Details. Who should apply for the Marketing Communications diploma? Successful students often also have previous work experience or additional post-secondary education. If this sounds like you, apply today on the Program Entry page - this popular program fills quickly! Do you have work experience in the marketing field or some post-secondary education? Because of the intensive training of the marketing communications program, any previous experience you have can make you prepared to perform better in this program and beyond. Your experience may also mean you can earn course credits toward your diploma to accelerate your education. Find out if you're eligible for advanced placement. By having your training focus on the applicable, hands-on skills in marketing and communications, you’ll be prepared to begin work immediately after graduation. Many employers in marketing specifically recommend this program and then look for graduates to hire into marketing, advertising, promotions, and public relations roles both in Canada and across the world. Additionally, you’ll have the option of applying your course credits from the diploma program to further study. Whether you decide to begin working right away, or focus on further training, you’ll have the opportunity to transfer credits toward full- or part-time study for your Bachelor of Business Administration. If you think this program is for you, please begin the application process early to increase opportunities for acceptance. This program is highly sought after and meeting the basic requirements is not a guarantee of entry. Check for current Marketing Communications program availability. Once accepted, your seat in the program will be reserved. All applications will be reviewed by the program area. Admission is competitive and will be offered to the most qualified applicants. Candidates who wish to apply to the Marketing Communications option must declare this option/specialization at the time of application. The courses in this program are designed by working marketing professionals to give you the most current, applicable knowledge and skills in marketing, communications, economics, public relations, and more. As part of your courses, you’ll engage in in-class lectures and labs, as well as a 10-week internship within an organization’s internal marketing team for hands-on, real-world experience. The Internet, and advances in digitization and social media are transforming how organizations interact with existing and prospective customers. This course covers the fundamentals of direct response marketing as it exists now in a digital world. Students learn digital and direct marketing strategy development and campaign planning for increasing customer acquisition, conversion, retention and growth. This course is part one of a two-part Digital and Direct Marketing curriculum and covers the following topics: segmentation, personalization, crafting the offer, crafting the call to action, conversion strategy, content strategy, social media marketing, e-mail marketing, direct mail, catalogues and print DM. Examines the development and execution of the media plan. Students maintain close contact with agency media buyers and other industry factors to ensure a practical direction to the course. Quantitative media planning techniques are evaluated in light of most recent computer applications. Provides marketable skills in media planning and buying, to qualify students for career entry consideration in advertising agencies. Prerequisite: MKTG 3218 or a minimum of one year's experience in an agency media department. ​To be competitive in today's market, a successful business person needs to be able to leverage internal data, and utilize the appropriate analytic methods to drive overall company performance. In this course you will learn how to optimize revenue and profit by making strategic marketing decisions based on marketing analytics. Students will develop practical analytical skills including: applying marketing analytical techniques to establish customer segmentation schemes; develop a dashboard for effective reporting and alerts; predict revenue and ROI impact of specific marketing and sales strategies; and develop tests for optimizing business impact. Students will complete hands-on projects applying the major areas of study to real business situations. Presents a capstone course in which students work in teams of five or six to develop and present to a client a comprehensive promotion campaign with real world constraints. Students incorporate theoretical concepts of marketing and promotions into practical applications in developing their client's campaign. Students practise "pitching" the account in competition with other teams. Prerequisites: All Level 3 courses. Provides students with a work experience position in a wide spectrum of industry sectors. On-the-job performance is fully evaluated. Prerequisite: All Level 3 and 4A courses (this is a capstone course). The Internet, and advances in digitization and social media are transforming how organizations interact with existing and prospective customers. This course is part two of the two-part Digital and Direct Marketing curriculum. It covers advanced elements that include, but are not limited to, search engine optimization, search engine marketing, display advertising, mobile marketing, Google analytics, campaign metrics and campaign testing. This specialization provides students with the strategic, analytical and tactical skills to increase customer acquisition, conversion, retention and growth. Prerequisite: Successful completion of all courses in terms 1, 2, 3 and 4A. By working closely with industry professionals, you’ll engage in real-world work experience with the Marketing Communications Diploma Program. This gives you the most up-to-date information, skills, and job contacts in a dynamic field to help you secure the rewarding career you want. As part of this program, you’ll develop a strong foundation in areas like marketing, business communications, public relations, and more through in-class lectures, labs, group projects, and a 10-week, four-day-a-week internship where you work directly in the company offices in a job of your choice. The intense, focused program is renowned in the industry and designed to give you the skills, confidence, and knowledge to begin and accelerate a successful career in marketing. The intensive, fast-paced training in this program prepares you for the daily excitement in marketing, advertising, and public relations communication. You’ll develop a strong foundation in digital and traditional media, marketing research, business analytics and more to lead you to a wide variety of marketing communications job opportunities. As a graduate, you will have an extensive range of employment opportunities. You can work for a large full-service agency like Rethink Canada, a PR company like Talk Shop Media, a promotions firm like Brandlive, a large company like BC Lottery Corporation or TELUS, a not-for-profit like BC Children's Hospital, or any number of small- to medium-sized firms. Review labour market information for specific jobs for Marketing Communications graduates on CareerBuild. Additionally, you’ll have the option to apply your course credits toward completion of your bachelor's degree. 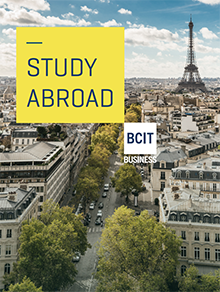 The credits you earned can be applied to studies at a number of other colleges and universities, or specifically toward BCIT's Bachelor of Business Administration for full- or part-time study. Do you have a degree, diploma, or completed a substantial amount of post-secondary courses? You may qualify for advanced placement into the Marketing Management - Marketing Communications program. Students that qualify for advanced placement can enter the program in the middle of first year or the beginning of the second year depending on the number of transfer credits received. For more information about eligibility requirements and the application process, please download the Marketing Management - Marketing Communications Advanced Placement Guide [PDF]. Each specialty course in the second year is taught by an instructor who is both an industry expert and a talented educator. All instructors bring current, relevant job experience to the classroom while many instructors still work in the industry. Several of these faculty members have received the School of Business Excellence in Teaching Award. The faculty team also meets each term to refresh course content and ensure that the courses remain on the leading edge.